Hedgerow aromatherapy candles are a relaxing and romantic blend of delicate neroli, rose and basil. This is the perfect romantic gift for home or away. 3 sizes available. Think Spring flowers and dreamy evenings in the garden. The floral Hedgerow aromatherapy candles gives you that relaxed feeling like you’re on a spa break. An indulgent blend of delicate neroli, rose and basil. This sumptuous best seller is romantic and feminine. A floral fragrance that makes a lovely wedding gift, anniversary gift or a special gift for her any time of year. Browse Join’s full collection of soy wax candles, reed diffusers and room mists here. Note: If you order products from more than one brand, they your order will arrive in different parcels. Candles, diffusers and room mists by Join are sent by Royal Mail signed for 2nd class within the UK. We’re happy to deliver outside of the UK – please contact us before you order for a shipping quote. This will likely be around £10 for Europe and £15 for rest of world (country dependent). Orders are sometimes handmade to order, so will be within 1-5 business days. If you need an order quickly or if your order hasn’t arrived as expected, please get in touch here. You can see the Chalk & Moss delivery and returns policy here. Your order will be sent directly by Join (who receives your name and address), as instructed by Chalk & Moss. Note if you order items from different brands on chalkandmoss.com, they will arrive in different parcels. Join scented aromatherapy candles are hand crafted in small batches, using soy wax, essential oils, amber apothecary jars and recycled packaging. Each candle comes gift wrapped in a recycled Kraft cardboard box. You can add a personalised message at checkout if you wish for it to be included. The candles use vegan, carbon neutral soy wax, cotton core wicks and the finest essential oils for a clean burn and natural fragrance. This means you can relax knowing you’re not inhaling any of the nasties that are often found in paraffin wax candle brands. The scent is natural and non intrusive. In 2018, Join added vegan diffusers and botanical room mists to their natural scent collection. These are offered in the same unique fragrances and natural ingredients in minimal, eye-catching packaging. Join products are lovingly packaged in amber apothecary style glass and recycled kraft gift boxes that you can reuse at your desk or around your home. Each fragrance has its own coloured symbol on the gift box. The box explains the health and wellbeing benefits of the candle or diffuser and its essential oils, much like aromatherapy. Join like to call it self care, and we couldn’t agree more! When burning your Join natural scented candle for the first time please keep it lit for a minimum of 3 hours and allow the wax to melt evenly to the edge of the jar. This will ensure a clean, even burn throughout the candle and will avoid what is commonly known as tunnelling, where only certain parts of the wax melt, limiting your lovely candle’s burn life. Soy wax has a lower melting point than other candle waxes, which is why the scent throw is so indulgent and lasts longer than other candles. Plus they’re made using beautifully rich essential oils packed full of goodness. It’s not unusual for the entire candle to melt during one ‘lighting’ so bear this in mind when moving it or blowing out the flame. We recommend investing in a good snuffer. That, and a good quality wick trimmer. Trim the wick of your candle to 5mm each time you light it to ensure no nasty black smoke is given off and your candle adds the feel you love to your room – including house plants, books, magazines, coffee, brunch, champagne or whatever makes you smile. Just be sure to burn your candle on a heat resistant surface away from children, pets and any item that can catch alight. Never leave a lit candle unattended and please do not burn your candle for longer than 4 hours at a time as this will cause danger such as the glass jar breaking. Do not light your candle when your wax is down to 7mm but please feel free to reuse and recycle your glass as a succulent holder, button or craft jar, or desk organiser. When opening the bottle of your naturally blended Join fragrance oil please take care not to spill the contents onto the bottle itself. Ensure you protect surfaces in your home before placing your diffuser in the desired location. Similarly, please insert the rattan reeds gently into bottle and turn them upside down as frequently as possible to disperse fragrance around the room evenly. Take care not to allow reeds to become dry in excessive temperatures as this will cause them to split. Feel free to contact us for advice or to purchase additional reeds, as your fragrance is of the highest quality and will evaporate very gradually. Join botanical room mists are intended for atmospheric use, for example, in bathrooms, washrooms and guest rooms. They can be used to refresh linens and materials but please be sure to spray at a distance and do not spray directly onto sensitive materials or surfaces such as silk or polished concrete. Please note Chalk & Moss and Join are not liable for product misuse. Enjoy your healthy, vegan home fragrance. Join is a London based, independent fragrance and lifestyle brand founded by two candle obsessed sisters. Their scented aromatherapy candles are hand crafted by them in small batches, using soy wax, essential oils, amber apothecary jars and recycled packaging. Their distinctly delicate and natural fragrances are inspired by their native Cornwall. The collection is available in three sizes, with varying burn time (see product size drop downs and the Delivery & Details tab). Magma earrings in silver - Lava collection: A unique hooped earring shaped like molten lava. Can be worn with one or both of the hoops (one on the back of the earlobe). Made from recycled silver. Available in two sizes. Vulcan handmade earrings - Lava collection: Elegant earring studs inspired by Vulcan, the god of fire and volcanoes. Handmade by Emma Aitchison from recycled silver and 18ct gold plate. A perfect gift for the strong woman in your life! Ben Nevis ring, Mountain collection: A ring with ridges and bumps, that gives you a daily reminder of mountains and the great outdoors. 22mm high. Handmade by Emma Aitchison from recycled silver and 18ct gold plate. 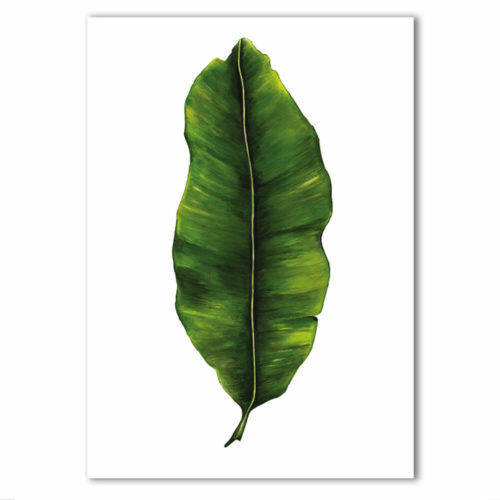 Signed A3 banana leaf print, showing the vibrant Musa Acuminata Painted, printed and hand finished in Belfast by Dollybirds Art. Printed onto thick 300GSM IPS uncoated art paper. Part of the inspiring Dollybirds Art botanical collection, getting you one step closer to nature.